1 Kings 1:1-35, 51-53, Nathan is instrumental in bringing Solomon to the throne. 1 Kings 11:1-13, King Solomon worships other gods. Prophets were typically fairly astute politicians themselves. After Absalom's rebellion was defeated, David regained control of the kingdom and lived many years. When he became old and feeble, Adonijah, David's oldest living son, assumed that he should inherit the throne without going through the formality of waiting until the old king was dead. David had planned for Solomon, a younger son whom he had had with Bathsheba, to inherit. When the prophet Nathan found out what Adonijah was up to, he made sure that David's selection of Solomon – a much more suitable candidate – went into effect. Adonijah feared for his life and took sanctuary by holding on to the "horns" or corners, of the altar. Solomon assured him that if he behaved himself, Solomon wouldn't harm him. Some time ago when we read about David and Goliath, we were discussing in Sunday School how old David might have been when he fought Goliath. The Bible doesn't say. He was thirty years old when he became king of Judah. Between the time he killed Goliath and the time he became king in Saul's place, he spent a considerable period alternately being Saul's favorite soldier and running for his life because Saul was trying to kill him. No information is given that will let us determine whether that period was 5, 10, or 15 years long. No prophet after Nathan is recorded as having preached to Solomon. Instead, God spoke to him directly three times. Solomon started off great – very smart, a God-worshipper, politically savvy. – but then he developed a severe problem with women. (Okay, okay – I know what you're thinking, so I'm just going to say it: things don't change much. That is exactly why the Bible is still relevant!) Solomon's problem was not that he had 700 wives and 300 concubines. That would have raised some eyebrows, but it wasn't actually illegal or immoral. His problem was that he built shrines for the gods of his wives, which was bad, and the worshipped in them, which was intolerable. The only thing that saved Solomon from going the way of Saul was God's promise to David to keep one of his descendants on the throne forever. Yesterday we read about Solomon’s request for wisdom, and today we read about how he used the wisdom that God granted to him. 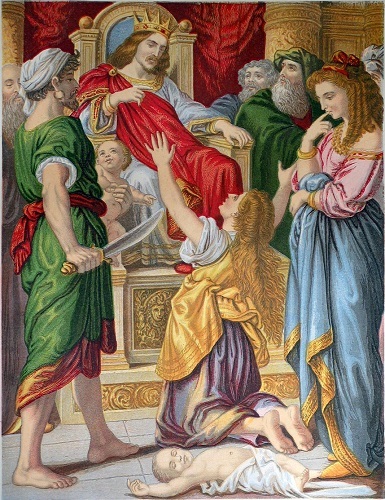 The artist has caught the moment in split second after vs. 25, when King Solomon has just given the order to divide the baby in two. The real mom is frantic, just like the real mom in yesterday’s illustration. Today, though, she’s throwing herself before the king – she knows where the real power is! Yesterday the dead child was nowhere to be seen. It took me a while to realize that the baby on the floor in today’s illustration must be the dead child, because he looks remarkably healthy. The artist apparently felt that he should include both babies, but he flinched when it came to showing a dead baby. Good for him! The hint is enough. The most striking part of this illustration, to me, is the look on the second woman’s face: she is actually thinking over the king’s offer! “Maybe half a baby would be better than none,” she thinks to herself. Then she says, “Cut him in half! That way, he’ll belong to neither one of us.” The artist has perfectly captured the cold-hearted calculation of her soul. 1 Kings 11:26-40, 12:16-17, 20, 25-33 King Jeroboam and the prophet Ahijah. God always keeps His word, so He started planning who would take over the bulk of the kingdom after the death of Solomon. God sent the prophet Ahijah to promise the crown of the ten northern tribes to Jeroboam, one of Solomon's officials. The longer Solomon ruled, the more oppressive he got, and it didn't help his mood any to see God's promise being enacted. When he died and his son Rehoboam came to the throne, the people came to Rehoboam and said, "Your father Solomon was too harsh. Lighten up a little, and we'll serve you." Rehoboam, being young and stupid, said, "You think my father was harsh?! You ain't seen nothing yet!" The people, having had it up to here with Solomon (and probably having heard about Jeroboam waiting in the wings) responded, "Fine! But we don't have to put up with this! We're outta here!" Jeroboam became king of the northern kingdom, Israel, just as God promised, but then he did something that was even more stupid than Rehoboam's hotheaded announcement: he didn't trust God to perform on the rest of His promise. So he created shrines at Dan (in the far north) and Bethel (in the south of his kingdom) and installed golden calves. It's a little unclear what he had in mind. Let's give him the benefit of the doubt and assume that he had in mind a heretical form of worship of the true God. Later, of course, the worship became so perverted that many or most people thought the calves were the gods. This is "the sin of Jeroboam the son of Nebat," which is mentioned in connection with every northern king that follows. 1 Kings 13:1-6, 14:1-18 King Jeroboam, the man of God, and Ahijah again. God hates all kinds of sin, but he really hates apostasy (worshipping other gods), and he absolutely won't put up with apostasy from the people he has made special covenants with. He gave practically the entire kingdom to Jeroboam and his descendants forever, with one little requirement, "Obey me." So what did Jeroboam do? First crack out of the barrel, he set up shrines and put in golden calves. So the prophet Ahijah comes to the shrine and announces that Jeroboam and his family are history. What's my golden calf? What's yours? 1 Kings 15:25 – 16:7, The prophet Jehu speaks to Kings Baasha and Elah. You've heard the saying, "You have to kiss a lot of frogs before you find a prince." Just about every king of the northern kingdom, Israel, turned out to be a frog. God chose several men to be king of Israel, and several other men chose themselves by assassinating a reigning king. You remember that Ahijah told Jeroboam that because of his idolatry, every male descendant of his would die (I Kings 14:9-10)--that is, he would have no lasting dynasty. Not only did Baasha, like the other kings of Israel, continued the idolatrous practices of Jeroboam, but when he took it upon himself to take over the crown (without any anointing from a prophet) by killing Nadab the son of Jeroboam, he went too far and killed everyone in the family. God sent the prophet Jehu to tell Baasha that God was going to get rid of him. 1 Kings 16:29-17:1; 18:1-15 Introduction to the prophet Elijah, King Ahab, and Queen Jezebel. Another day, another dynasty. Baasha's son Elah lasted for a couple years on the throne of Israel, and his assassin, Zimri, lasted for about a week. Then Omri killed Zimri and took over. Ahab inherited from Omri. You have probably heard of Ahab, and I know you have heard of his wife Jezebel. Every northern king from Jeroboam to Ahab had kept the shrines at Dan and Bethel--remember that these shrines seem to have been a heretical form of worship of God, which later deteriorated even further toward actual idolatry. But now the situation gets a lot worse. Jezebel was a Phoenician princess and a very religious woman; unfortunately, her religion was Baalism, and Ahab and Jezebel set up Baalism as a co-state religion, along with the heretical worship of God. Baalism entailed, among other practices, male and female cult prostitution and child sacrifice, and Jezebel supplemented these by killing as many prophets of God as she could find. Elijah the prophet got fed up and said that there was going to be a drought, as a demonstration of the power of the true God. Naturally this put Elijah on the "most wanted" list. After remaining out of sight for long enough to make his point, Elijah got back in touch with the king and queen. 1 Kings 18:16-46 Elijah defeats the prophets of Baal. Baalism was a scourge. "Baal" means "master," or "owner," so many of the gods of Canaan could be referred to as "baals," as in vs. 18. Typically a baal was the chief god of whatever pantheon a particular ethnic group worshiped, although many of these also had a specific name, like Molech, the god of the Ammonites, or Baal-zebub, the god of Ekron. "Baal" by itself in the Bible usually refers to the Philistine version, whose worship Jezebel and Ahab introduced into the northern kingdom. Shrines to baals were typically in the form of a stone pillar. Asherah (also variously named) was the chief goddess, whose shrine was a tree or a wooden pole (very often translated "groves"). Some of the highlights of these various Canaanite religions were fertility rites, male and female cult prostitution, self-mutilation, and child sacrifice. The prophets hated all idols, and they often got really sarcastic, as in vs. 27. A god who sleeps? or goes to the bathroom? Even Baal-zebub, "Lord of Flies," is a mocking pun on the god's real name, Baal-zebul, "Baal the Prince." Elijah's dramatic victory over the prophets of Baal didn't rid the kingdom of Israel of Baalism, unfortunately. Today we read more about the prophet Elijah. Ahab was king of the northern kingdom of Israel. His wife was Jezebel, a Phoenician princess, who was considerably more religious than Ahab. Unfortunately, her religion was Baalism, one of several idolatrous religions of the Canaanite peoples. Elijah and Jezebel did not get along. Elijah called a 3-year drought down upon the land after Ahab began worshipping Baal. Jezebel ordered the deaths of the prophets of God. Elijah challenged Jezebel's priests to a duel (see below), and when they lost, Elijah ordered the people to kill all the prophets of Baal. Jezebel furiously ordered Elijah to be killed by the next day. Elijah hid out for a while, but God told him to get back to work and anoint Jehu as a successor to Ahab. When Jehu took over a few years later, he had Jezebel thrown out of a high window, and the dogs ate her. The Old Testament isn't for the fainthearted! Actually, neither is the New Testament. 1 Kings 19:1-8 Elijah runs for his life; God tells him to get back to work. My children were very picky eaters. When my daughter was in college, my husband asked her at dinner if she would like to have some particular dish. She responded, "No no no no no no no no! Bleah!" I looked at her calmly and said, "Dianna, in this family we do not say, "No no no no no no no no bleah. We say 'no, thank you.' " Several days later, my husband asked her if she would like some other dish. She replied very sweetly, "No, thank you." Then she turned to me with narrowed eyes and said, "But you know what I mean." Jezebel was incensed that Elijah had killed her Baalist prophets. In vs. 2, the text says that she said, "So may the gods do to me and more also..." This idiom occurs 12 times in the Bible. The text says one thing, but the reader is expected to know that it means something else. What Jezebel said was a curse upon herself if she didn't see Elijah dead by the next day. Curses are dangerous, so in order to prevent either the writer or the reader from inadvertently cursing himself, the writer substitutes this idiom. But you know what it means. Elijah took Jezebel's threat seriously and ran for his life. God, somewhat unsympathetically, told him to get back to work anointing a new king of Syria, a new king of Israel, and a new prophet. Elijah lived and Jehu eventually killed Jezebel, so apparently her curse worked. Do you remember the ad campaign based on the slogan, "When E.F. Hutton talks, people listen"? In a crowded room where everyone was talking, someone would quietly mention E.F Hutton, and everyone else would immediately stop talking and start listening. Maybe we should try a new campaign: "When God talks, people listen." Elijah the prohet was running for his life and hiding out in the desert. God tried to talk with him, but Elijah wasn't in the mood to listen. Earlier in the week we read passages that describe God's voice as thunderous, shaking the the earth. But, the prophets are careful to point out, thunder is not God, no matter what the pagans believe. Wind is not God. Fire is not God. When you hear a quiet voice saying, "What are you doing here? ", that could very well be God. In Sunday School we were observing that bad things can happen to good people. Often this is because some bad person makes it happen. Naboth stood in the way of what King Ahab and Queen Jezebel wanted. (Remember Jezebel? She's the Baalist Phoenician princess who ordered the deaths of all the prophets of God.) Not only were Ahab and Jezebel bad people, but also they had the power to do something about it. There are two important lessons in this reading. First, when something bad happens to you, don't blame God--he's just as upset as you are. Second, it's poor planning to cause something bad to happen to another person; try to avoid this mistake. 1 Kings 21 Elijah condemns Ahab and Jezebel. If President Bush came to you and offered to "pay you whatever you want" for your house, would you sell? I might very well do that. I've only lived here half my life, and right now we are in the middle of remodeling the den. Moving to a new house would probably be easier. Still, I wouldn't expect Mrs. Bush to put out a contract on me if I refused. My husband and his brothers grew up in a house that originally belonged to their grandmother. They thought long and hard before selling it after their mother died. Naboth's land had been in his family for centuries. In Israel, each parcel of land was assigned by lot to specific families when the Israelites returned from Egypt (e.g., Joshua 13:6). The idea was that the assigned land would remain in the family in perpetuity. Naboth quite reasonably saw no reason for the king to have his family's land. 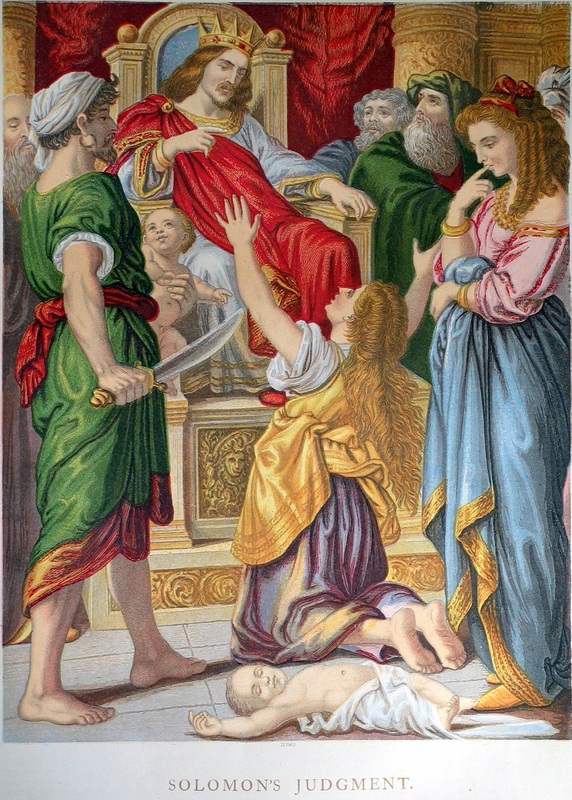 Jezebel, either in ignorance, in compassion for her husband, or in an effort to further introduce Philistine customs into Israel, had Naboth murdered so that Ahab could have the land. This was the last straw for God, and he sent Elijah to Ahab and Jezebel to announce that their dynasty was over. 1 Kings 22:1-38 King Ahab prefers spurious prophets to Micaiah. For forty years after the division of the Davidic kingdom into Israel and Judah, the two kingdoms were at war. King Jehoshaphat of Judah and King Omri of Israel, Ahab's father, made peace. They cemented the treaty with the marriage of Jehoshaphat's son Ahaziah and Omri's daughter Athaliah. So Jehoshaphat and Omri's son Ahab were kinsmen and allies. Jehoshaphat was faithful to God throughout his life, but as we saw earlier, Ahab was at least half Baalist. No wonder the prophet Micaiah always had bad news for him. One of the standard fiction plots (most recently seen in the Harry Potter series) begins with a prophecy about somebody. The Bad Guy doesn't want the prophecy to come true, so he does everything he can to prevent it. Then--in a surprising and dramatic twist!--the Bad Guy's own actions bring about the fulfullment of the prophecy. This also happens in real life, as we see below. Here, however, the subject of the prophecy and the Bad Guy are the same person. Elijah's gory prophecy from I Kings 21:19 and Micaiah's prophecy from 22:23 are fulfilled in vss. 35-38. 1 Kings 22:51-53; II Kings 1:1-17 Elijah and King Ahaziah. My cat doesn't like to be picked up or held. It's very difficult to give her a first pill and close to impossible to give her a second pill. If she ever needs regular medication, she will die, because she would rather die than be given a third pill. Elijah was a cranky old prophet, there's no question about that. You'd be cranky, too, if you had spent a couple of decades unsuccessfully trying to get the kings of Israel to stop worshipping baals and golden calves. Ahaziah was even worse than his Baalists parents and the heretical Jeroboam. At least Ahab had some people in his court who claimed to be prophets of God, and Jeroboam had the real God in the back of his mind when he set up false shrines. Ahaziah didn't even bother to keep up a pretense of worshipping God. After Ahaziah was injured in a fall, he sent messengers to consult Baalzebub to find out what was going to happen to him. Elijah intercepted them and sent them back to Ahaziah with a message from God that he would die. Maybe that seems a little harsh to you, but let's look at this from God's point of view. Here's the king of Israel, an influential person. Does he use his influence to get rid of an evil, imported, false religion? Does he get rid of a home-grown false religion? Does he call on God in a time of trouble? No, no, and no. So God's message is just a statement of fact: without me--and you don't want me--you are going to die. Does Ahaziah take that as an opportunity to repent? No! He apparently preferred to die. 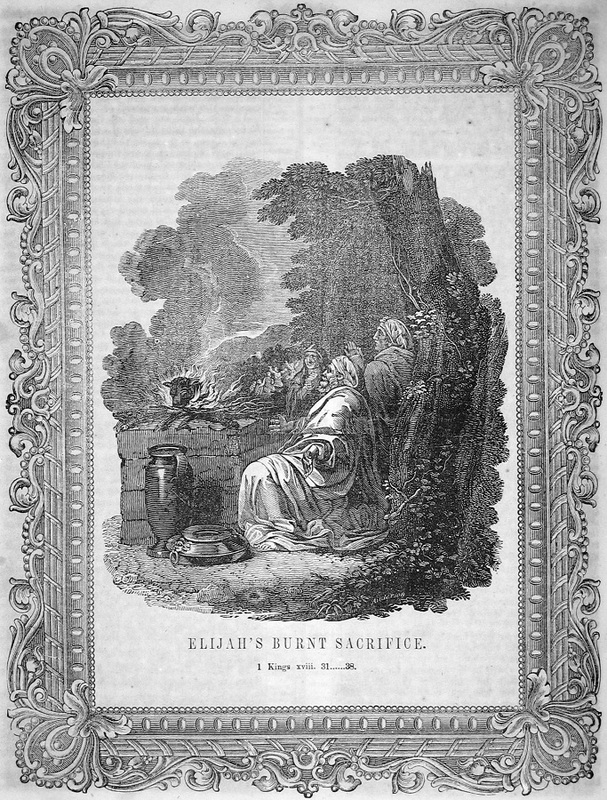 The woodcut showing Elijah's burnt offering is from the family Bible of John O. Spencer and Lydia Bunn, married 18 Nov. 1857 in Hector, Schuyler Co., NY. A complete listing of the posted images from this Bible is given at Ducks in a Row, Inc.